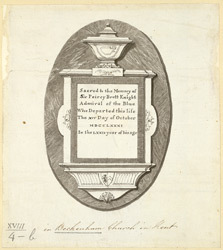 Drawing of a memorial wall plaque from Beckenham Church in Kent. It is dedicated to 'the Memory of Sir Peircy Brett Knight Admiral of the Blue Who Departed this life The XIV Day of October MDCCLXXXI In the LXXII year of his age'. A note on the reverse of the drawing explains 'This Monument is in Beckenham Church in Kent. It is White Marble upon an oval slab of Dark Marble, mix'd with white and resemble's lights.......round the inscription table is a Border of Dark Marble. It is 5 foot 8 inches high, 2 foot 10 inches wide'. The monument is decorated with classical style motifs and heraldry.